Center of Madrid, next to the America, 10 minutes walk from the Royal Palace and Plaza Mayor. Beside the trail, ideal for walking to know the historical center, the main museums, the Royal Theatre and terraced areas, restaurants, tapas and trade. Modern and quiet neighborhood with all services and several bus and metro lines in the immediate vicinity. It has two bedrooms; one with two single beds (90 cm nest) and the main one with a double bed built-in wardrobe of 3.5 m. and bathroom en suite with shower. Large living room, fully equipped kitchen and additional toilet (sink and wc, with washer and dryer). Easy access from the airport by metro (Puerta de Toledo) and commuter train (T4-Pyramids). Possibility of parking in the own farm (€ 15 day). Sink and shower towels for all occupants, soap, shampoo, hair dryer. Lovely clean apartment in safe area, not too far from city centre. Would happily stay here again. Better suited to families as shower in the en-suite but didn’t cause us any problem. The apartment was extremely good value. It was in a convenient but quiet street, a five minute walk from public transport - buses, metro and affordable taxis - into the old centre of Madrid but it was also easily walkable in 20-30 minutes. The apartment was immaculately clean with fully equipped kitchen( inc kettle and dishwasher). We are two friends travelling so needed a room each and the two bedrooms were generous sized - even the single bed was wide and very comfortable. There was also a second toilet with washing machine and tumble dryer available to use.The living room was spacious with 2 sofas and there was also good wifi in tbe apartment. We thought it was excellent value and would not hesitate to recommend it. Elena and Daniel were very helpful and flexible. A good base for seeing Madrid. Apartamento muy tranquilo,…amplio,.. y muy limpio,… en el barrio se encuentran bares,… tiendas,… supermercado a 2 min andando,… Genial. Daniel es amable y te explica mucho sobre el bario y las cosas de ver..
Para una próxima vez que iremos a Madrid miraremos si este apartamento esta libre. 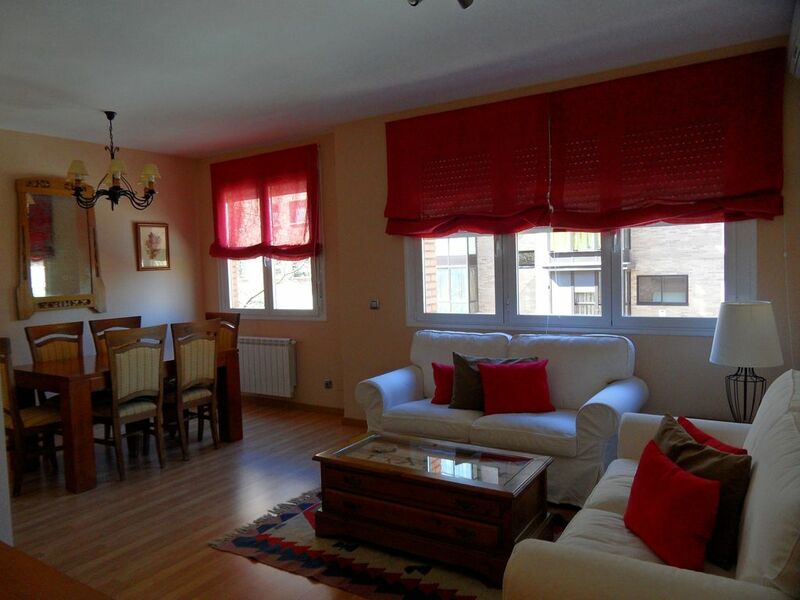 Close to the Puerta de Toledo metro stop, very close to a grocery store. If you want, walking distance to the Royal Palace, though I'd just take the metro or bus and save your legs. Kitchen is great, has everything you need. Neighbors are a bit loud during the day. We could hear them vacuuming, and such, but it is quiet at night. El apartamento esta muy bien ubicado a solo 20 de Sol, ideal para conocer el centro de Madrid. Center of Madrid, next to the America, 10 minutes walk from the Royal Palace and Plaza Mayor. Beside the trail, ideal for walking to know the historical center, the main museums, the Royal Theatre and terraced areas, restaurants, tapas and trade. Modern and quiet with all services and several bus lines and subway nearby neighborhood. Posibilidad de plaza de garaje en el mismo edificio 15€/día. 30€ en concepto de limpieza final. 40€ en concepto de check in anterior a las 15:00 h o posterior a las 21:00 h. WIFI gratis.